For this fortnight our word is "Weary". Once I read the word Patter chose of us to work with this verse in Matthew came to my mind. I asked my sweet husband what verse came to his mind when we he heard the word "weary" and he quoted the same verse. How often I forget that I should be walking with Jesus and giving Him my burdens. He wants to keep company with me - how wonderful is that? I like those words " Get away with me" but do I really live them. do I really get away with Jesus - do I really spend as much time as I ought to in prayer - communing with Him. He wants me to. He wants you to, as well. Such a pretty page, Anne-Marie! 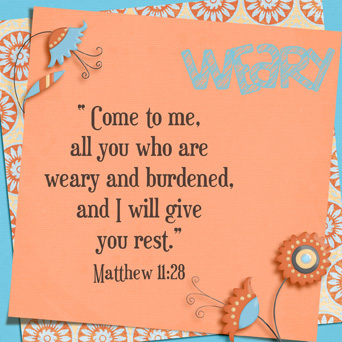 This is the same verse that came into my mind as soon as I read the word was "weary"! It's such a special verse, isn't it? Thank you SO MUCH for sharing these verses from The Message...how beautiful they are! How special our Lord is that He cares so much! "Learn the unforced rhythms of grace." That's so beautiful! Thank you!